Among the great mysteries that handicappers face every time they analyze a race is how to assess class. Unlike their human counterparts, there is no easy way to determine which horses have it and which horses don’t. Thoroughbreds don’t star in reality TV shows; they don’t accuse each other of infidelity on the “The Jerry Springer Show;” they aren’t named Snooki. Actually, that last bit isn’t true. There was a horse named Snooki, but the daughter of Empire Maker never made it to the races (contrary to what Stephen Hawking believes, this clearly proves the existence of a higher intelligence). The point is: evaluating class isn’t easy… but that hasn’t stopped folks from trying. Dr. William Quirin demanded that a horse show him the money. 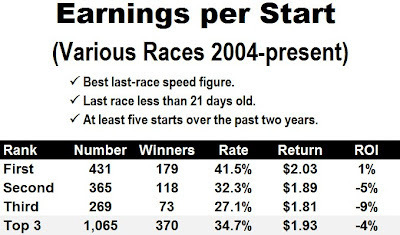 In “Winning at the Races: Computer Discoveries in Thoroughbred Handicapping.” Dr. Quirin ranked each horse by its average earnings per start to determine class. From an ROI standpoint, the top-ranked horse in average earnings per start fared about as well as the top betting choice in Quirin’s time (late 1970s, early 1980s). 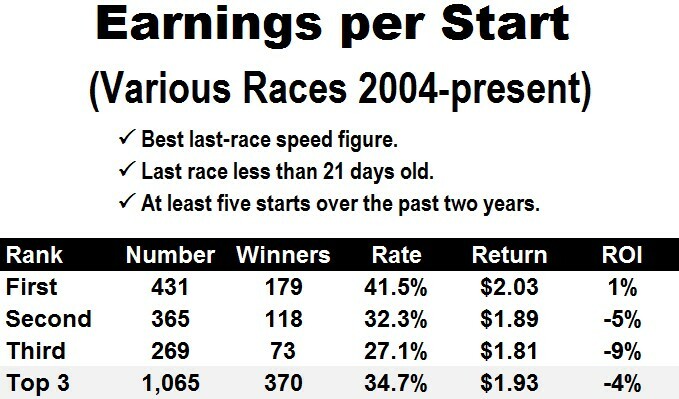 And those numbers have held up fairly well in the new millennium, which is somewhat surprising given the preponderance of state-bred bonuses, specially carded races and casino-enhanced purses we see these days. While top-ranked horses performed worse, the second- and third-ranked contenders performed considerably better than they did three decades ago. Notice that such horses did even better than favorites, proving that it does indeed make sense (and a few dollars) to pay attention to the money trail. Havre de Grace appears poised to set a record for generating the largest negative pool in the history of pari-mutuel wagering (just a guess) when she makes her 2012 debut on Saturday. The defending Horse of the Year is scheduled to face four rivals in the New Orleans Ladies Stakes at Fair Grounds in what may be the biggest mismatch — at least on paper — since a 2007 boxing bout featuring future super welterweight champion Yoshihiro Kamegai and referee Ukrid Sarasas. * Havre de Grace earned an average of $231,857 per start last year — about 50% more than the entire purse value of the New Orleans Ladies Stakes and 10 times more than her closest rival (Juanita) averaged over the past two years. * The lowest Brisnet speed figure (BSF) that Havre de Grace earned last year (104 in the Beldame) is still about six lengths superior to the career-best BSF of any of her opponents. * Larry Jones’ stable star won three Grade I races, including the Woodward against males, and two Grade II affairs in 2011. Among her rivals on Saturday, only the aforementioned Juanita has won any graded races at all (Juanita captured the Grade II Indiana Oaks versus three-year-olds last year). Of course, much the same could have been said about Rachel Alexandra when this race was written for her in 2010... and she was upset by Zardana. SUGGESTED WAGER(S): Win on 3 at even (1-1) odds or greater. SUGGESTED WAGER(S): Win on 5 at even (1-1) odds or greater. Click HERE to get a free Win Factor Report for Friday's Woodbine Harness program. COMMENTS: Although this is a highly contentious race — and, worse, a rider’s race — I’m going to take a shot with NORMAN ASBJORNSON if the price is right. Simply put, the early splits will tell the tale of this event. If the pace is slow, all bets are off (figuratively speaking, unfortunately). REDDING COLLIERY is dangerous when allowed to carve out easy fractions, as he proved last time (105 Brisnet speed figure following a -4 ESR) and INHERIT THE GOLD absolutely loves to stalk a soft pace. The son of Gold Token won his penultimate race when the early leader recorded a -2 ESR, yet was defeated — at odds-on, no less — in his most recent outing following a -10 ESR pace. Still, there is a lot of early zip in this field, so it will come down to the jockeys’ perception of the splits. That’s not a comforting thought, but I’ll roll the dice if “Norman,” an improving type who should relish faster fractions, is 5-1 or better. SUGGESTED WAGER(S): Win on 6 at odds of 5-1 or greater. COMMENTS: Obviously, HAVRE DE GRACE looks tons the best on paper, but there may be value in the secondary pools and the exotics. Hence, I’ll be keying STERLING MADAME in the New Orleans Ladies. JUANITA is likely to draw the bulk of the cash after the defending Horse of the Year garners her 80+ percent share of the pool(s), but I think “Madame” is faster. If jockey James Graham denies Juanita the early lead, I think the daughter of Mineshaft is toast. Even if he doesn’t, however, I still prefer Sterling Madame over anything else in the (remainder) of the field. SUGGESTED WAGER(S): PLACE on 1 if Havre de Grace controls at least 75% of the place pool and/or SHOW on 1 if Havre de Grace controls at least 75% of the show pool.